Carole was born in the UK but has spent most of her life in Zimbabwe where she met and married her husband, and they had their three children. Due to the turbulent situation in Zimbabwe, Carole and her husband returned to the UK in 2003, and after a difficult year doing temp work, she was employed as the Administrator for House of Heroes. This organisation preceded Eagle Community at Ovis Farm. She retired in 2011 and involved herself in other organisations and activities working with homelessness, drug and alcohol addiction. 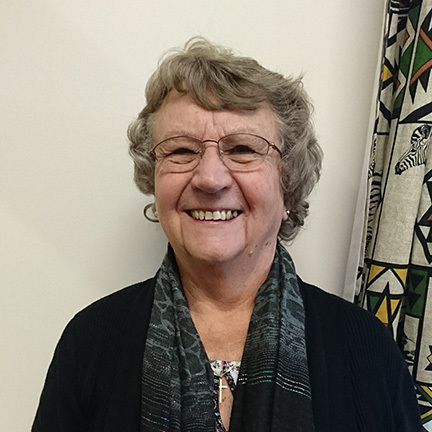 In November 2014, God spoke to Carole quite clearly about starting the work which has evolved into and has become what Eagle Community is today: helping men through crisis situations in their lives due to homelessness, addictions and prison. The project enables them to become stable and it equips them through mentoring and training to enter the workplace, live independently and become fulfilled and productive members of society. Her passion is seeing men develop a meaningful relationship with Jesus and develop to reach their full potential spiritually, physically, emotionally and in their career choices. Damien is one of two co-founding directors and also serves as chairman of the board of trustees. His many and varied tasks include focusing on inter-agency relations, business development and community resourcing. He has a heart to see men thrive and not just survive, helping those who want to help themselves. Damien would describe himself as a man of God who is devoted to developing the kingdom, Christian unity and the development of God-fearing men. He works onsite for 2 days per week. Jason Huxtable is the newest member of the team, having joined Eagle Community as Housing Projects Manager in October 2017. Age 27, he is married to Mary and grew up in the Bratton Fleming area, coming to faith some 5 years ago. His main roles, amongst many, are to disciple the men and work practically alongside them teaching them work-based skills including gardening, woodwork, DIY and mechanics. Jason also supervises the cooking, cleaning and weekly shopping that is necessary to keep the house running smoothly. When he's not working, Jason enjoys riding his motorbike off-road and he's also partial to a spot of fishing too. All in all, Jason Huxtable is a vital member of the team at Eagle Community. Rose was born in the UK but spent most of her life in Zimbabwe where she met and married her husband and they had their two children. She spent much time doing the administrative work on the farm with her husband and gained a lot of experience in this regard through her husband's different businesses. After much stress and aggravation on the farm, they finally decided to leave Zimbabwe and arrived in the UK in 2008. When they first arrived Rose worked as a live-in carer and her husband did various jobs including factory work until they both retired in 2016. It was shortly after this that Carole shared with her about the work at Eagle Community and the need for someone to do the books and accounts, and she came out to the farm, not knowing what to expect. Once there she immediately fell into the role of bookkeeper and has developed a real passion for the work they do with the men, and thoroughly enjoys it when she has opportunities to share God’s word and pray with them and see them grow in their spiritual walk. Dean has a heart to see the guys grow in God and help them realise their potential. He is a qualified heating and plumbing engineer, but Dean also enjoys all aspects of the construction industry. Dean has been working up here for 2 years now, on and off as a volunteer, with the hope of being more full- time in the future. He likes to engage the guys within the ongoing projects at Eagle Community. Dean is married to Michelle and they have two boys. Mark Bowden left college in 2004 after completing a one year course in Arboriculture at Sparsholt College in Winchester. Through his knowledge of trees and the natural world, he began to believe that all of this could not have happened by accident, but that there was a creative power at work behind it. This led to Mark attending an Alpha course in 2006, where he eventually made a commitment to Jesus in 2007. Through various personal connections at Eagle Community, Mark felt that God was speaking to him about working with the men at the rehab, using his woodworking and chainsaw skills. His plan was to train anyone who was willing, to use a chainsaw for crosscutting and the felling of small trees. Mark is hoping to generate timber for the community through the felling and planking of some of the trees on the farm, which can be used eventually to construct rustic furniture.